While iOS still offers no Bitcoin emoji and Apple doesn't allow crypto mining in apps, there are now two different Bitcoin glyphs, part of the Siri Shortcuts app. Apple has included, for the first time, a pair of Bitcoin glyphs in iOS 12, The Next Web reports. The glyphs are currently available to view through the new Siri Shortcuts app, when setting a logo for a shortcut. A shortcut can be set up to allow users to ask Siri about the current price of Bitcoin, but the glyph can be set to represent practically any user-created shortcut in the app. 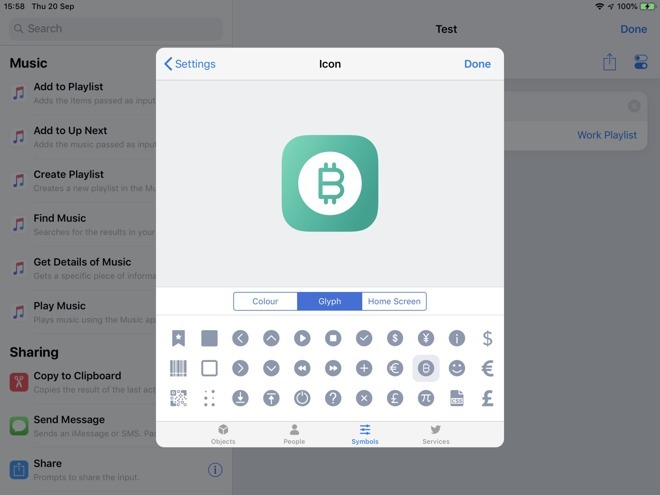 The new iOS does not offer a Bitcoin emoji, which some cryptocurrency enthusiasts have sought. At WWDC in June, Apple added new language to its App Store review guidelines, to state that "apps, including any third party advertisements displayed within them, may not run unrelated background processes, such as cryptocurrency mining." Apps are also allowed to "facilitate virtual currency storage," although they may not mine directly on the device. On a couple of occasions in 2013 and 2014, the App Store dropped Coinbase from the Apple Store, although it later returned. In 2016, Apple dropped several "fake" Bitcoin apps from the App Store.